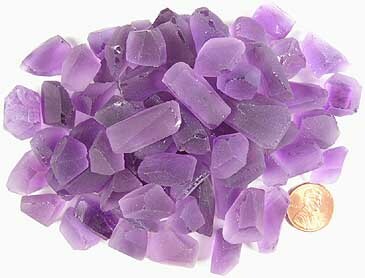 Rose d' France Amethyst from Brazil - $.30/carat. This material is bright and clean. As with most amethyst, these stones have some zoning. Best yield is a square cushion or heart. Best yield is a short barion pear or round. Best yield is a square cushion or round. Best yield is an oval. Best yield is a barion round or barion heart. Best yield is a trillion or round. Best yield is a square cushion or roundn. Best yield is a round, trillion cushion or heart. 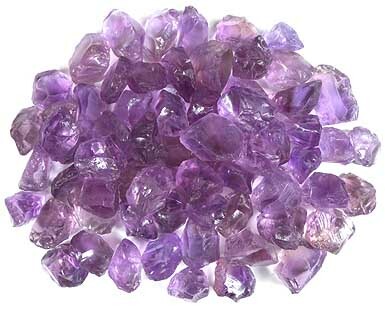 Medium Color Maraba Amethyst from Brazil - $.80/carat. This material is sliced and ground clean. 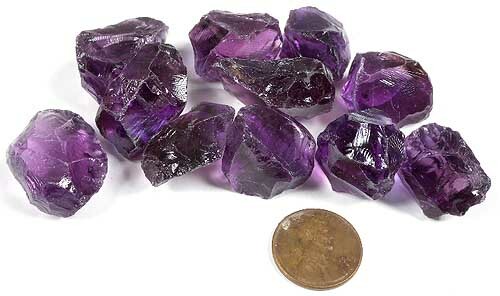 As with most amethyst, these stones may have some zoning. 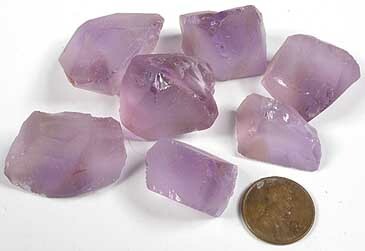 Light Colored Bolivian Amethyst Large Size Pieces - $.50/carat. This material has been sawn and ground clean and is well shaped for a good yield. Yields fine, bright, large stones with moderate color zoning. This amethyst is from a mine that produces ametrine. So, some pieces may contain small lenses of citrine at the surface. Representative sample of Medium-Light Colored Bolivian Amethyst @ $0.50. Best yield is heart or trillion. Best yield is a heart or pear. Best yield is a square, heart or round. One corner is citrine!! Best yield is a round or heart. 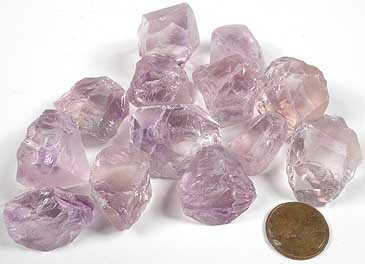 Medium-Light Colored Bolivian Amethyst - $.85/carat. Representative sample of Medium-Light Colored Bolivian Amethyst @ $0.85. Best yield is an oval or pear. Best yield is a very short oval or round. Best yield is a wide marquise, long pear or shield. Best yield is a heart or trillion. Best yield is barion oval or barion pear. 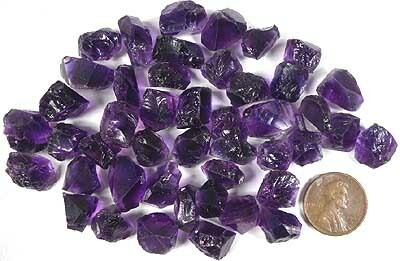 Medium-Colored Bolivian Amethyst Medium Size Pieces - $1.00/carat. Yields fine stones with very little zoning and consistent medium color. Representative sample of Medium Colored Bolivian Amethyst. 'Siberian Color' Extra Premium Uruguayan amethyst! 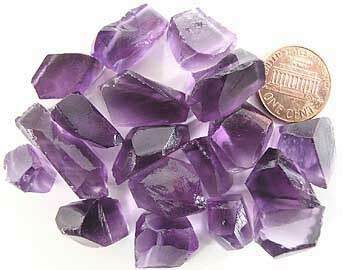 Uruguayan amethyst is the best there is. It is produced in relatively small quantities and therefore we often run out of this fine material. 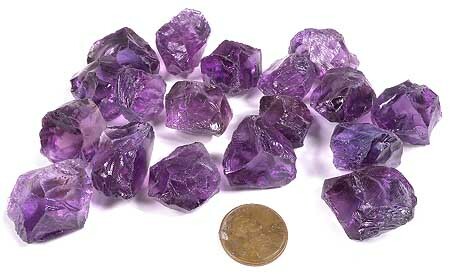 There are two grades of Uruguayan Amethyst: Deep Purple and Extra Premium. Extra Premium has the darkest color and is the very best amethyst you can get. This dark-colored material tends to have different color zones. The colors mix in cut stones and produce flashes of magenta and blue. This material cuts lighter than the photographs would make you think. Every piece was hand selected for quality and shape from large parcels. Measures approximately 8.8 x 6.5 x 5.7mm. Best yield is a shield or pear. Measures approximately 13.6 x 8.9 x 6.4mm. Best yield is an oval or shield. Measures approximately 13.1 x 10.2 x 6.9mm. Best yield is an oval or round. Measures approximately 13.5 x 10.9 x 9.3mm. Best yield is a pear or oval. Measures approximately 13.2 x 6.8 x 6.7mm. Best yield is a pear. Measures approximately 12.9 x 9.3 x 9.4mm. Best yield is an oval. Measures approximately 11.6 x 9.8 x 5.8mm. Best yield is an oval or shield. Measures approximately 15.9 x 7.6 x 7.8mm. Best yield is a heart with a little waste. Measures approximately 16.8 x 8.6 x 6.0mm. Best yield is an oval or pear. Measures approximately 13.2 x 7.5 x 5.5mm. Best yield is a long emerald or marquise. Measures approximately 12.7 x 10.1 x 5.4mm. Best yield is a trillion, heart or pear. Measures approximately 11.3 x 9.3 x 7.3mm. Best yield is a round or heart with a little waste. Our Special Extra grade Bahia amethyst has a nice deep color reminiscent of the fine Bolivian Amethyst, but with a rosier tone. It will cut gorgeous, large, brilliant stones with superb color. Measures approximately 19.8 x 19.8 x 12.8mm. Best yield is a heart or oval. Measures approximately 21.7 x 12.6 x 11.5mm. Best yield is an oval or pear. Measures approximately 21.3 x 16.8 x 12.3mm. Best yield is a short oval, pear or round. Measures approximately 20.5 x 16.8 x 12.7mm. Best yield is a heart or trillion. Measures approximately 20.1 x 17.7 x 13.2mm. Best yield is a round. Measures approximately 16.9 x 14.6 x 11.5mm. Best yield is a heart, trillion or round. Measures approximately 20.4 x 16.9 x 11.5mm. Best yield is a heart or round. Measures approximately 18.7 x 16.4 x 14.8mm. Best yield is an emerald or oval. Measures approximately 18.1 x 15.0 x 12.0mm. Best yield is a trillion cushion or heart. Measures approximately 20.7 x 15.6 x 13.1mm. Best yield is a square cushion. Measures approximately 18.3 x 15.5 x 14.3mm. Best yield is a round. Measures approximately 21.1 x 18.5 x 14.2mm. Best yield is a heart, trillion or round. Our Special Premium grade Bahia amethyst has a nice deep color reminiscent of the finest Bolivian Amethyst, but with a rosier tone. It will cut gorgeous, large, brilliant stones with superb color. Measures approximately 17.5 x 17.0 x 13.9mm. Best yield is a heart or round. Measures approximately 19.6 x 17.0 x 12.0mm. Best yield is a barion oval, square cushion or trillion. Measures approximately 18.8 x 16.1 x 13.7mm. Best yield is a short oval or round. Measures approximately 21.0 x 16.5 x 12.0mm. Best yield is an oval. Measures approximately 19.7 x 18.8 x 14.5mm. Best yield is a heart or round. Measures approximately 16.6 x 16.4 x 15.2mm. Best yield is square cushion or round. Measures approximately 17.6 x 16.2 x 13.5mm. Best yield is a round. Measures approximately 21.3 x 14.6 x 11.7mm. Best yield is a long oval or pear.